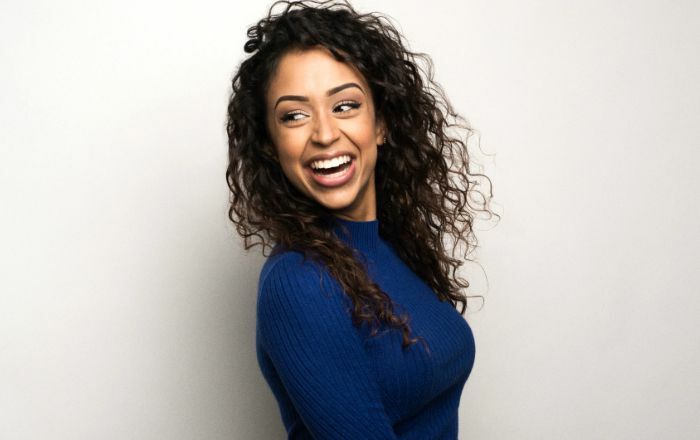 Liza Koshy, better known by her online pseudonym Lizzza, is an American actress and YouTuber who gained visibility online with her eponymous YouTube channel. She has amassed over 13.5 million subscribers on YouTube and a massive following on other social media accounts. Known for playing Violet Adams in the Hulu original television series Freakish, Liza also starred as Aday Walker in Tyler Perry’s horror comedy film Boo! A Madea Halloween and The Explorer in the YouTube Red original series Escape the Night. Liza Koshy was born on the 31st of March 1996, in Houston, Texas, United States of America. She’s currently 23 years old. She is multiracial and has Malayali Indian ancestry on her father side and German, Swiss German and English ancestry on her mother’s side. Liza went to the Lamar High School in Houston. After that, she was homeschooled and joined the college in the fall of 2014 to study Business Marketing. Liza Koshy has been dating fellow social media star David Dobrik from November 2015. Liza Koshy made her first acting debut with the 2016 comedy flick, FML, where she played the role of Princess Aubrey. Her first lead role was Liza with the 2016 film Jingle Ballin’. Liza first appeared on the talk show, Young Hollywood in April 2016. From 2016, she is playing the lead role of Violet Adams in the Hulu original series Freakish. She was also cast for a recurring role, The Explorer, in the YouTube Red series Escape the Night. She has appeared in a TV commercial for Beats by Dre, which also featured some of the famous celebrities such as Nicki Minaj, Rebel Wilson, Young Ma and Amber Rose. Liza’s net worth is estimated at $4 million US dollars. This money mostly comes from films, TV appearances, endorsements, YouTube ad revenue and other social media activities. She lived with her boyfriend in Los Angeles. Liza is half Indian and half Caucasian. She has collaborated with fellow Vine Stars Jake Paul, Lance210, Crawford Collins, Boris Laursen, Alex Holtti and Tasia Alexis all of whom featured in one of her Vines titled ‘How girls check out guys vs. How guys check out girls’. Koshy has won two Streamy Awards and a Teen Choice Award. In 2016, She was included in the list of “The 7 Female Comedians You Need to Know” by Teen Vogue. The Hollywood Reporter included Koshy in its 2017 list of “15 Rising Crossover Stars”. Koshy hosted the live preshow at the 2017 Golden Globes Awards, which received 2.7 million live viewers on Twitter. She is one of the hosts on Total Request Live on MTV and was the first “digital star” interviewed for Vogue magazine’s “73 Questions” web series. She is proficient in English as well as Spanish.